Rihanna's new Porsche 911 Turbo S should look nice in front of her new Pacific Palisades home, which she recently purchased for $12 million. The singer’s new 11,000-square-foot mansion features seven bedrooms, nine bathrooms, media and game rooms, lounging deck with a barbecue and bar, and a fountained swimming pool. Not to mention, the massive home comes with 20 parking spaces. 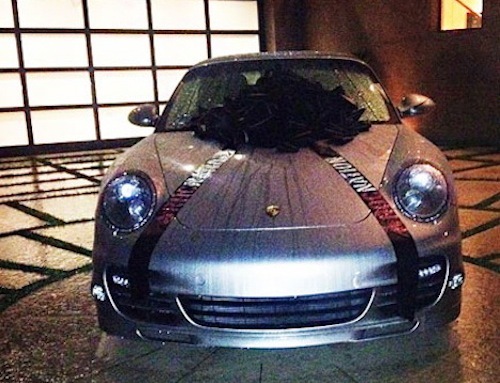 Aside from the Porsche 911, Rihanna’s new 20-car lot will likely contain her previous gift from the Roc Nation. In January 2012, Rihanna’s management gave her a black Jeep Wrangler after the artist was named best-selling digital artist of all time. In fact, Rihanna has garnered an incredible 60 million digital downloads as of December 2012. The “We Found Love” singer’s car collection may also include her previously purchased Chevrolet Suburban LTZ, which touts a 6.0-liter V8 engine. Rihanna originally bought her Suburban in 2010 so it’s unclear whether it’s still part of her collection. As for her latest car, the Porsche 911 was first introduced in 1963, and remains to this day, one of the most legendary sports cars ever. In 2004, the historic sports car was named number three on Sports Car International’s Top Sports Cars of the 1960s, number seven on the list of Top Sports Cars of the 1970s, and number seven on the list of Top Sports Cars of the 1980s. Earlier this year, the 2012 Porsche 911 S Coupe received the prestigious 2012 World Performance Car award. Born Robyn Rihanna Fenty, Rihanna is a Barbadian recording artists and actress. She has released seven albums, beginning with her 2005 debut Music of the Sun. Rihanna most recently release is Unapologetic, which came out in November. In addition to her 60 million digital downloads, Rihanna has sold over 25 million albums worldwide.